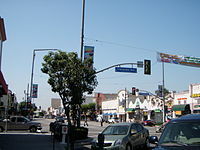 Huntington Park was made in 1906 as a streetcar suburb for workers in the rapidly expanding industries to the southeast of downtown Los Angeles. To this day, about 30% of its residents work at factories in nearby Vernon and Commerce. This page was last changed on 11 June 2018, at 02:24.